Freshman Casey Schmitt prepares to swing during the Aztecs 3-2 win over Fresno State on April 20 at Tony Gwynn Stadium. 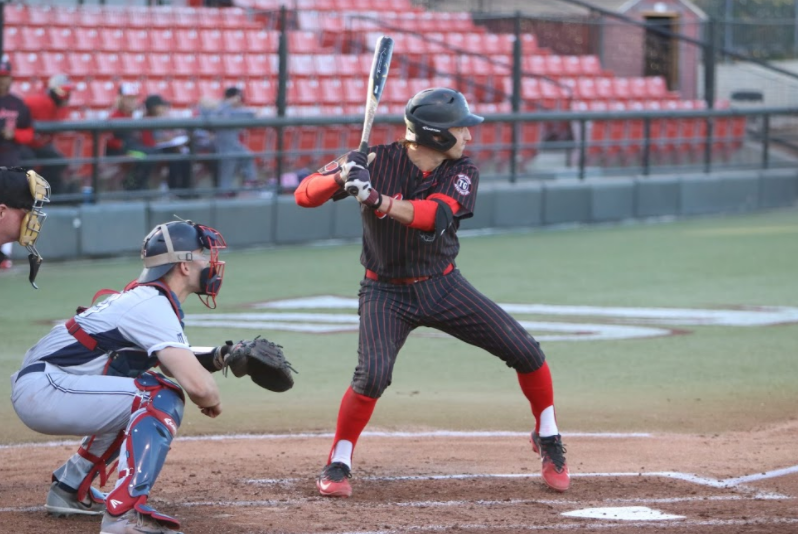 San Diego State baseball could not make it two wins in a row against Fresno State, losing the second game of a three game set 7-4 at Tony Gwynn Stadium on Saturday night. 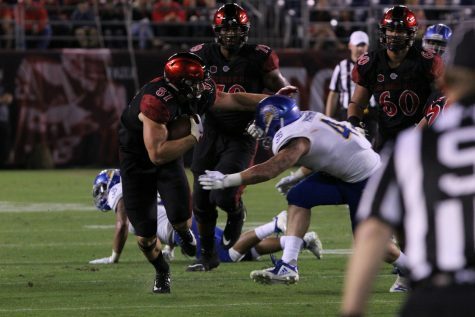 SDSU dropped to 25-14 on the season with the loss, while the Bulldogs improved to 23-15. Junior right hander Garrett Hill took the loss after allowing three runs in six inning, although one was unearned. It’s just his second loss of the season. 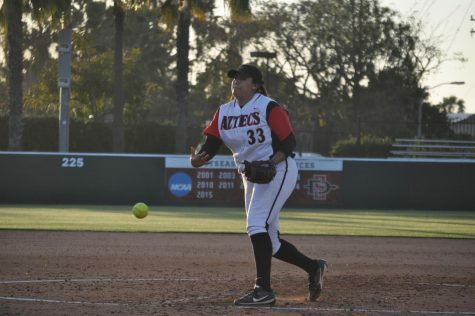 The Aztecs threatened late, scoring two runs in the bottom of the ninth following an RBI single and hit-by-pitch, but could not complete the comeback. SDSU wasted no time in the first, taking advantage over some less-than-stellar Bulldog defense to take an early lead. 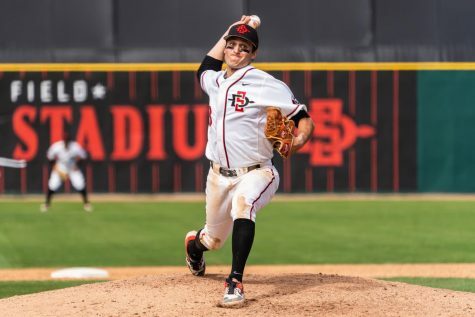 The Aztecs had just one hit in the inning but still scored two runs thanks to a botched grounder by the second baseman and an errant throw from the shortstop that would have ended the inning with the bases loaded. 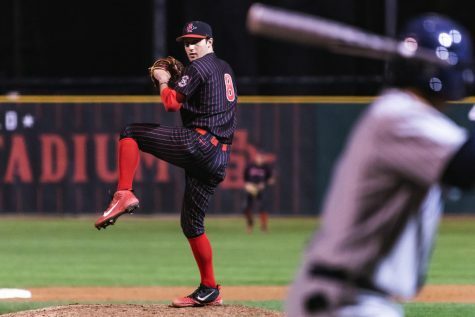 Despite the early runs from the Aztecs, they could not get much going in the way of offense until the end of the game, as those two runs in the first inning were all they’d muster before the ninth. In the end, they only recorded five hits, the last of which came after an RBI single off the bat of junior catcher Dean Nevarez. Hill opened the game for the Aztecs, while fellow junior right hander Edgar Gonzalez did the same for the Bulldogs. He got into a bit of a jam in the fifth, after senior first baseman Nick Warren laced a triple with one out into the right-center gap. It bounced around between the wall and the outfielders, allowing him reach third. However, Hill rebounded and got a grounder to first and a strikeout to end the frame. Fresno took the lead in the top of the sixth on a single following a one out double, but the runner was cut down trying to advance to second. Sounds of jeers came from the Fresno faithful in the stands. The Bulldogs continued to pile on in the following inning, chasing freshman lefty Christian Winston for sophomore right hander Adrian Mardueno. Mardueno wasn’t able to record an out, letting two more runs score before freshman reliever Casey O’Sullivan couldn’t close out the inning unscathed after also giving up two more runs to the Bulldogs. Fresno did strike back in the third, scoring a run after sophomore second baseman Jacob Maekawa couldn’t pick up a grounder ranging to his right. 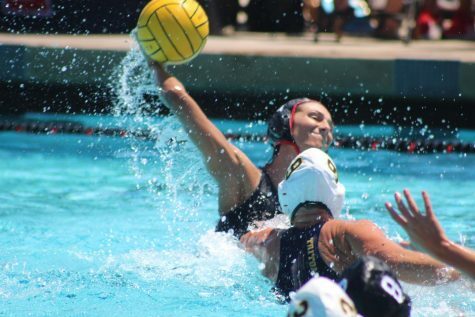 The first hit of the game given up by Hill brought him home and Fresno within one. 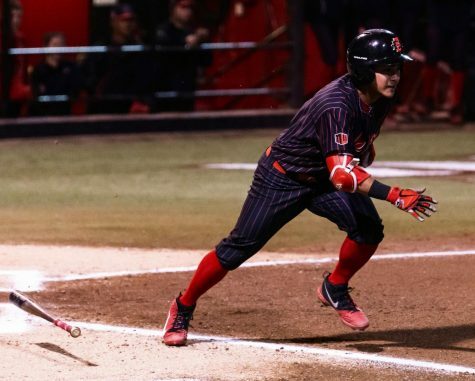 Despite only managing five hits throughout the entire game, the Aztecs still reached base at a nice rate, walking nine times in addition to a hit by pitch. “We got ourselves out, it’s as simple as it gets,” Martinez added. 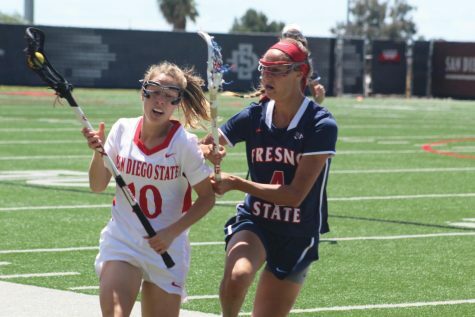 SDSU and Fresno will both try to come away from the weekend with a series win tomorrow. 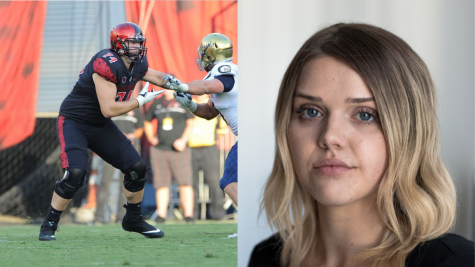 With the Aztecs’ loss tonight, the career record between the two teams sits at an even 99-99, so tomorrow’s game won’t just decide the series, but also the race to 100 wins.